During 2012 in my second year at University I took part in my first Global Game Jam. For most of our team of 6 it was their first Game Jam as well, so we didn't quite know what to expect. By the end of the weekend we had fun and formed a playable game. 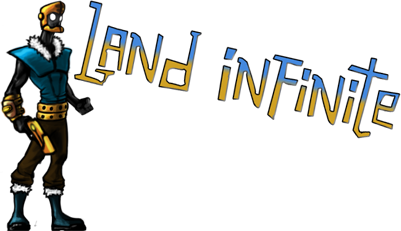 That game was Land Infinite. A 2D continuous side scrolling platformer, in which you have to fight off infinite spawning enemies. When a certain number of enemies have been killed the level changes and new location specific enemies start to appear. If the change level score is not met then the level will continue to loop until the player dies or reaches the required score. 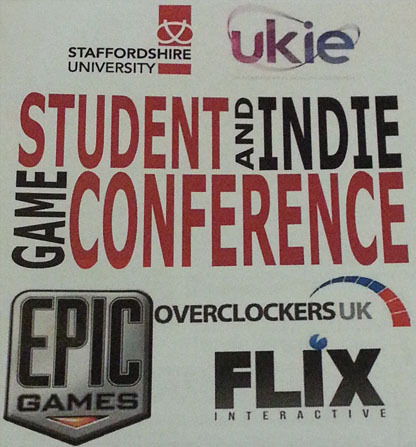 Staffordshire University teamed up with Ukie, and were sponsored by Epic Games, Overclockers UK and Flix Interactive, to host a Student and Indie Game Conference last Wednesday (22nd October 2014). The event was free for everyone to attend, and was ideal for students, alumni (like myself) and current indie devs, who were looking to gain an insight into what needs to be considered for a start-up studio. Over 20 industry speakers visited Staffordshire University, to give talks about their areas of expertise. Topics ranged from tips for starting up a studio, to building a fan base for a game. All of the talks I attended were highly informative, and everyone was confidently knowledgeable about their area. A couple of talks that really grabbed my interest were by Louise O'Conner from Rare Ltd, and Simon Callaghan from Johnny Atom. These tips are things I am going to try and do more of myself to keep thinking creatively, and use the methods to help develop personal project ideas in the future. The second talk I mentioned by Simon Callaghan covered points for planning a PR (Public Relations) campaign. He gave an overview of each area a campaign should cover, and stressed the importance of planning ahead a full PR campaign, to use during the entire development schedule of a game, and not just doing it as an afterthought. PR is an area I find quite interesting, particularly because of the wide array of methods available to now interact with a target audience. For example, with sites like Twitch becoming ever more popular it provides real time interaction with the players, that isn't just limited to expos and other events, making it easier to get feedback on updates while a game is still in development. With a good turnout of people, I hope Staffordshire University and Ukie will run an event similar to this in the future, so more people can get an up to date insight about games from the industry insiders. I would certainly look forward to heading along to the event again. Eurogamer expo time, so it was back down to London again. Being able to get early entry tickets came in handy, being able to just walk up and play a hand full of the games before it got really busy. It was fun getting to try Tearaway for the Vita and all of the other games that I'd wanted to try out. It was also a really nice surprise to run into some familiar faces working at the event as well The collection of freebies gathered during the day were definitely worth picking up. 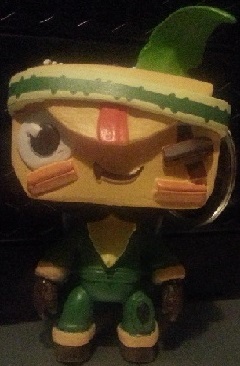 I now need to find somewhere for this little guy to go. I attended the Women in Games Conference in London for the first time this year, and I was selected by Uni to part in the Student Show case to display my portfolio. It was an excellent opportunity for myself and other students to show our work directly to professionals in the industry. As well as taking part of the show case I also got to attend the key note speeches, various panels and the round tables. It was an awesome event to attend with many inspirational and helpful talks/discussions providing some handy tips for CVs etc. A very insightful event to attend and a great event for networking during the breaks.